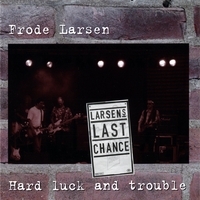 Frode Larsen is a norwegian singer, bass player, and songwriter, touring over the years with different artists and bands, both scandinavian and american, mainly in the field of blues and rock. Four releases so far, including mainly original songs: Larsen's Last Chance 1994, Chicago Bound "Rockin' feet" 1997, Jukeboxman 2002, and Hard luck and trouble 2007. With musical roots in blues, this of course is a major ingredience to all these albums. The new one, Hard luck and trouble is basically recorded live (with some overdubs and well mixed in MLP studio Norway), played by really good musicians; guitars, organ/piano, bass, drums and some amazing blues harp. Rockin' tunes, blues and ballads - check it out!